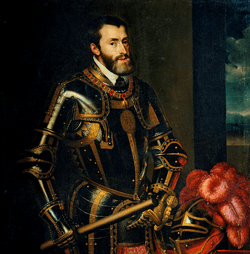 Charles V (24 February 1500–21 September 1558) was Holy Roman Emperor, King of Spain, Naples, and Sicily, King of the Burgundian Netherlands and King of New Spain (Mexico).He was called Carlos I in Spain, though he is also commonly called Carlos V. His nickname was "El Dorado" or "the golden one" because of his good and impressive rule. Philip the Handsome and Joanna the Mad of Castile were his parents. His grandparents on his mother's side were Ferdinand II of Aragon and Isabella I of Castile. Their marriage made Spain into one kingdom. His grandparents on his father's side were Emperor Maximilian I and Marie, Duchess of Burgundy. His Majesty or His Imperial Majesty was first used when he was king. His Empire became large and was known as "in which the sun does not set". He was also known as "The Emperor of Universal Dominion." The city of Toledo was the imperial capital and main seat of Charles V, Holy Roman Emperor, and his court. Equestrian armour of Emperor Charles V.
Charles V, Holy Roman Emperor Facts for Kids. Kiddle Encyclopedia.